There are four pubs in Godmanchester, The Black Bull is located on Post Street and is closest to Huntingdon. The Royal Oak is on The Causeway overlooking the River Ouse and Old Chinese Bridge. The White Hart is located on Cambridge Road near the Co-op and The Exhibition at the corner of Earning Street and London Road. There are some great drinking holes in Huntingdon if you are looking for a longer pub crawl. You could start at the Samuel Pepys Pub on Huntingdon High Street or Prima Restaurant next door. The Bridge Hotel has a great bar with an open fireplace and is located on the old bridge over the Ouse that separates Huntingdon & Godmanchester. The local branch of the CAMPAIGN FOR REAL ALE has more information on other local pubs close to Huntingdon & Godmanchester together with walks including the Ouse Valley Way. Matt Harvey at The Exhibition on Saturday 30th April. 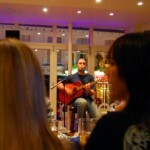 Matt Harvey is playing again at The Exhibition in Godmanchester on Saturday 30th April from about 9:30pm. Should be a busy night!